Shanghai - China's Feng Shanshan is on course to become the first back-to-back winner of the 2017 season as she battled swirling winds to take a one-shot lead in the Blue Bay LPGA on Friday. Roared on by her home crowd on the southern Chinese island of Hainan, victory in the final round on Saturday at Jian Lake Blue Bay Golf Club could also propel the world number three to the top of the rankings, depending where current number one Park Sung-Hyun finishes. "Given that today was actually very, very windy, I really held up ground, especially with my approach shots to the greens," the Chinese, who shot a one-over-par 73 and captured last week's TOTO Japan Classic title, told LPGA.com. "Obviously I made a lot of mistakes and I had a lot of recovery shots as well. But overall I'm happy with the past three days' performance." Feng was at seven-under par for the tournament, a one-stroke lead over Thailand's Moriya Jutanugarn, who is looking for her first LPGA Tour victory. Her third-round four-under-par 68 put her alone in second, with South Africa's overnight leader Ashleigh Buhai another shot back. 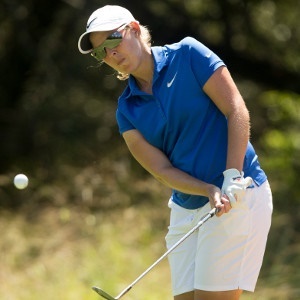 Buhai struggled on Friday, shooting a 76, but is still very much in the running. "It was quite a frustrating day," she said. The South Koreans Choi Na-Yeon and number one Park are tied fourth.